These stunning snapshots are from a series by Japanese photographer Tsuneaki Hiramatsu, who employed a variety of time-lapse techniques to capture the awe-inspiring beauty of fireflies in flight. The results aren't just beautiful - they offer us a whole new way of understanding these brilliant little bugs. Many of Earth's organisms generate light via a biologically specific chemical reaction called bioluminescence. This is different from biofluorescence, by the way; the difference being that a bioluminescent organism produces light on its own, while a biofluorescent organism emits light after first absorbing light from another source. While bioluminescence is exceedingly common in the Earth's oceans (as much as 90 percent of marine life is thought to produce bioluminescence in some form), it has a way of turning up on land, as well. Sometimes it pops up in mushrooms. Other times it's in fireflies. 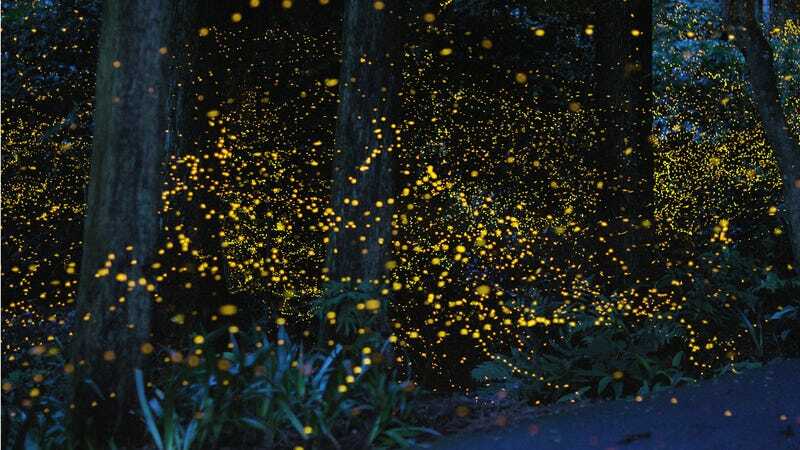 In the States, you'll find fireflies lighting up summer nights from Texas to New York with colors throughout much of the visible spectrum, but the scenes you see here were photographed at various locations in and around Maniwa and Okayama Prefecture, Japan between 2008 and 2011. You can check out more examples of Hiramatsu's firefly photography, some dating back as far as 2004, on his photo blog.